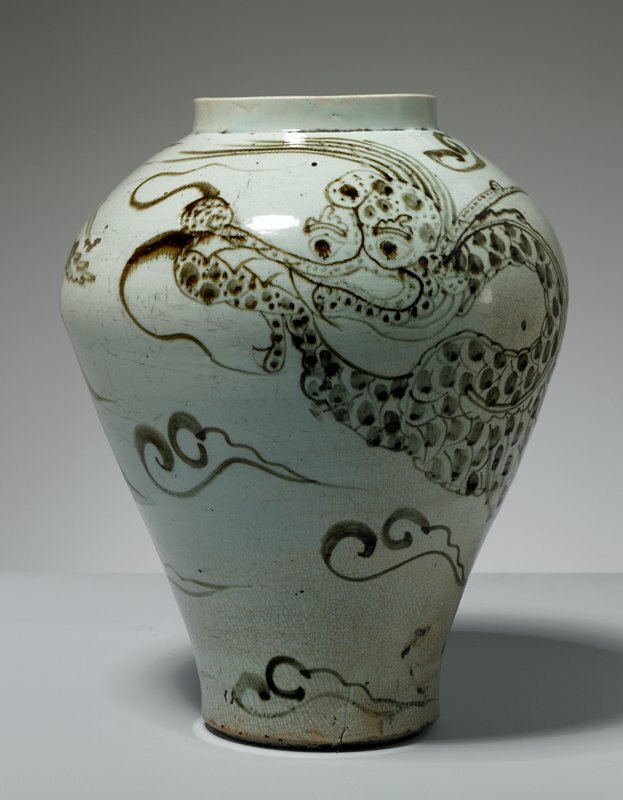 In addition to designs painted in cobalt blue, Korean potters between the 1600s and 1800s produced many porcelain objects decorated with underglaze iron brown-designs. Possibly because cobalt was an expensive material, blue-and-white vessels tend to be carefully painted. In contrast, Korean potters display a remarkable freedom in their iron-brown designs. Here, a dragon with a humorously long snout coils around the swelling sides of this robust jar. American architect Frank Lloyd Wright (1867–1959) was well known for his love of Asian art. Wright once owned this jar and used it to decorate his suite at the Plaza Hotel in New York City.